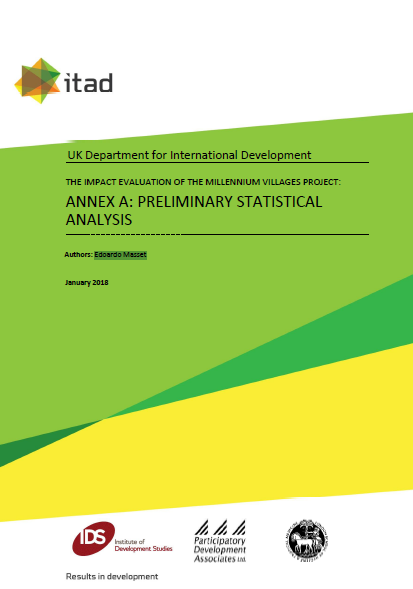 The evaluation design and the stratification of the comparison groups by distance to the MV villages – plus the statistical models used to assess impact. The datasets and an overall assessment of the quality of the data and their suitability for a difference-in-difference analysis. The take-up rates for most activities promoted by MVP, where we analyse the characteristics of households and individuals taking part in project activities and the beneficiaries. An assessment of the impact of MVP on its final outcomes, the Millennium Development Goals (MDGs), using a ‘dashboard approach’. An assessment of the impact of MVP on an aggregate measure of poverty using the multidimensional Oxford deprivation index. A discussion of the theory of change of MVP, where we illustrate the challenge of explaining the project impact in these circumstances, and a justification for the evaluation strategy adopted. The impact of MVP on expenditure, income and savings where we attempt to reconcile the impact observed on these aggregates within a unified conceptual framework. Detailed impacts by sector (in agriculture, health and education) on non-MDG outcomes and other intermediate indicators. A discussion of impacts not covered in other sections, such as migration, water access and vulnerability.